The Food and Health Department sticks to its old guns while key HKBU researcher Dr Chung Shan-shan looks to clear the air about previous media misstatements about her research results. Dr Chung Shan-shan (鍾姍姍), Assistant Professor of the Baptist University’s Department of Biology, has been oft cited in Hong Kong for her research on vaping (aka e-cigarettes). Dr Chung was commissioned by the Council on Smoking and Health (COSH) between October 2015 and February 2016 to lead a studies on the potential harm brought about by vaping. She found in favour of stricter regulation, or perhaps a total ban of the product, but is keen to clear up misconceptions about the research in previous media reports. She takes issue with previous media reports that neglected to report on nuances she presented, leaving a misleading impression that has been repeated and magnified in the community. “Our findings are in a stage of being assessed by an international journal and are currently under review [i.e. unpublished]. So I believe that’s why [the RCP report] did not take into consideration our discovery,” she says. Electronic cigarettes were found to contain one million times more cancer-causing substances than outdoor air in a study by Baptist University. Polybrominated diphenyl ethers(PBDEs), a flame retardant used extensively in furniture and electronic products, were detected in a range of 1.7 to 1,490ng/ml in the 13 brands of e-cigarettes. That level was much higher than in two samples of conventional cigarettes used in the study, which ranged from 5.6 to 6.3ng/ml. The chemical reduces the risk of burning in the plastic combustible component of e-cigarettes. But PBDEs disrupt the thyroid hormone and cause toxicity of the reproductive development. “Even though we don’t know the exact number of e-cigarettes one should take, not to mention that many of the carcinogenic effects are cumulative, I don’t think there is a safe margin,” said Chung, adding that the situation was worrying. While the packaging of the tested e-cigarettes either claimed they contained zero nicotine or did not mention nicotine, they actually containted a level ranging from 3.5 to 28.5 ng/ml. Adding to the concern, a University of Hong Kong study, commissioned by the council, found that 7.9 per cent of smokers aged 15 to 29 had used e-cigarettes, significantly higher than other age groups. The study, done between April and October last year, interviewed 5,252 people. Some 68 per cent did not know what they were inhaling. As 16 countries have fully banned the sales, advertising, import, distribution and manufacturing of e-cigarettes, the council’s chairman, Antonio Kwong Cho-shing, urged legislation to enforce a total ban as soon as possible. The Food and Health Bureau earlier stated the possibility of legislation would be reviewed, it was not clear when the regulation would go into effect. The Council on Smoking and Health (Cosh) on Monday called for an immediate ban on e-cigarettes, highlighting its danger through two separate studies. In one study, it found at least two cancer causing chemicals in 13 of the e-cigarette brands available in the market. The test, carried out by the Baptist University, found harmful chemicals such as formaldehyde and PAHs – both known carcinogens – in these brands. Dr Chung Shan-shan from the university’s biology department said these chemicals pose a high degree of risk to its users. The second study found more young people make a major section of e-cigarette users. Cosh urged the government to enact a total ban on the device as soon as possible, before the situation gets worse. When can we expect this insipid SAR Government to stand up for its citizens’ rights and sue Big Tobacco in Hong Kong for the costs of health care caused by their wretched product ? It seems the Financial Secretary, aka the Almighty, prefers the Profits Tax income from the enhanced addictive drug peddling murderers instead. The Australian government should sue the tobacco industry after landmark research found Australian smokers have a three times greater chance of dying today than a lifelong non-smoker, the president of the Australian Council on Smoking and Health says. Up to 1.8m of Australia’s 2.7m smokers are likely to die from their habit if they continue to smoke, losing an average of 10 years of life expectancy, the first Australian large-scale study on smoking and mortality, published in the international journal BMC Medicine, found. The study findings highlighted the extreme hazards faced by the 13% of Australians who smoked, an author of the study and director of the University of Melbourne’s global burden of disease group, Professor Alan Lopez, said. The research was led by Sydney’s Sax Institute using data from their 45 and Up study. Researchers linked health information from 204,953 study participants aged 45 and over from NSW, with data from the register of births, deaths and marriages. Previous research from the Sax Institute found pack-a-day smokers had a fourfold risk of dying early, while the risk of death for lighter smokers was more than doubled. The president of the Australian Council on Smoking and Health, Mike Daube, said the study revealed smoking as a “national catastrophe” because even though Australia had among the lowest smoking rates in the word, its effects were widespread. “That smoking will kill 7.5% of Australians means it deserves a massively increased focus, and we need to keep increasing taxes on tobacco, step up public health campaigns and limit the number of outlets that sell it,” Daube said. “It is time for the Australian government to follow what the US did about 20 years ago and sue the tobacco industry for costs incurred because of smoking, and force them to make internal documents public. Known as the Master Settlement Agreement, the 1998 court action involved 46 US states and several of the largest US tobacco companies. The tobacco industry was forced to pay the states more than US$200bn in compensation and make public previously secret documents. The chief executive of the Public Health Association of Australia, Michael Moore, said the research confirmed smoking as Australia’s most preventable cause of death and disease, killing even more people than previously believed. It meant politicians and policymakers must do “everything possible” to encourage smokers to quit, he said. “We cannot stand by and see yet more generations of Australians dying, often painful deaths, because they smoked,” he said. Hong Kong may move to ban e-cigarettes. Advocates claim it is the best alternative to reduce harm from smoking. Opponents claim the unknown makes it worth banning outright. Alan*, a local academic, is a smoker. It was time to kick the habit when his family welcomed a newborn daughter. He hadn’t been able to stop in the past, but now had new incentive. Strong incentive. And a new option. An alternative to conventional smoking cessation devices was presented to Alan in the form of a “vaping” device, aka the e-cigarette. Using a battery, an “e-liquid” is vapourised for the user to inhale producing a similar experience to smoking without any combustion involved. They can, but legally do not in Hong Kong, contain nicotine, the addictive substance in cigarettes. People can use them to control and reduce nicotine dosage and eventually give up nicotine altogether. Regular use of his e-cigarette enabled Alan to cut his smoking to one pack of cigarettes in three weeks, and then extended periods of zero smoking. He was on his way to reducing his nicotine dosage to zero. Unfortunately for Alan, a recent crackdown by the government on e-liquids containing nicotine disrupted his use of e-cigarettes. He has reverted to smoking a pack of cigarettes per day. His personal situation plays out against a broader campaign. 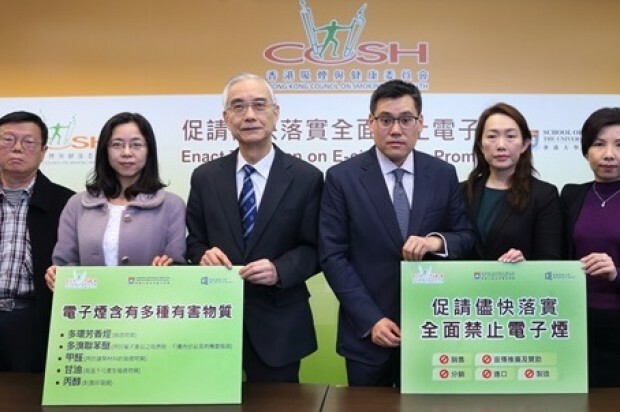 On March 30th, the Hong Kong Council on Smoking and Health (COSH) held a press conference advocating a total ban on e-cigarette products. A total ban on e-cigarettes would entail the “prohibition of sales, advertising, promotion and sponsorship, distribution, importation and manufacturing” of the product. Hours after the COSH press conference, Secretary for Food and Health Dr Ko Wing-man was quoted stating that the government was “inclined to agree” with the Council’s request citing possible health risks and the possibility that youngsters may pick up smoking [conventional] cigarettes after they begin smoking e-cigarettes. He added that detailed studies would be required before they could proceed with legislation. Currently, under the Pharmacy and Poisons Ordinance, any e-cigarettes containing nicotine and marketed as nicotine replacement therapy must be registered before sale and possession, under threat of a maximum penalty of HK$100,000 and 2 year’s imprisonment. No nicotine containing e-cigarette product has ever been registered as pharmaceutical products in Hong Kong, creating a de facto ban. Ray Story, founder and CEO of Tobacco Vapor Electronic Cigarette Association (TVECA), is an advocate for regulation, not banning it outright. Mr Story, an owner of several e-cigarette brands, successfully pushed for the legalisation and subsequent regulation of e-cigarettes in the United States and the EU. He was recently in Hong Kong to speak to the media on the matter after attending the Shenzhen International Electronic Cigarette Industry Expo where over 100,000 industry professionals gathered. Mr Story claims that the focus is misplaced. He explains, “when you look at conventional tobacco and how it’s used, you create all different types of chemicals when you light a cigarette.” A conventional cigarette is known to have approximately 600 chemicals in it and produces up to 7,000 when burned, at least 69 of which are known carcinogens. “An e-cigarette has five ingredients. So by not having all those chemicals and tar through combustion, it is therefore less harmful than conventional tobacco,” claims Mr Story. The five main ingredients in an e-cigarette, are nicotine, water, propylene glycol, glycerin, and flavouring. There are e-liquid options on the market that contain no nicotine, which are currently on sale legally in Hong Kong. Propylene glycol and glycerin, while found in many food items and cosmetic products, are often touted by opposers to cause health risks. At COSH’s press conference, Dr Daniel Ho Sai-yin, associate professor at University of Hong Kong, cited literature claiming the chemicals cause mouth and throat irritations, and, at high temperatures, form formaldehyde and acetaldehyde, known carcinogens. Investigating papers referenced by Dr Ho muddles the argument. The conclusions found in the report in the New England Journal of Medicine, from University of Portland researchers, titled “Hidden formaldehyde in e-cigarette aerosols”, were criticised earlier this year due to methods failing to reflect realistic situations. The report described what happened when researchers used two different voltage settings on the vaping device: “At low voltage (3.3 V), we did not detect the formation of any formaldehyde-releasing agents (estimated limit of detection, approximately 0.1 μg per 10 puffs).” In other words, when they tested a tank system at a realistic voltage setting of 3.3V, no formaldehyde was detected. But at an unrealistically high temperature setting of 5.0V, formaldehyde concentrations five- to fifteen-fold that of cigarettes were measured. The experiment showed that when overheated, vaping devices yield unacceptable levels of formaldehyde. Media reports, however, touted the more sensational conclusion, leading readers into believing that normal consumption of e-cigarette vapour can expose a user to cancer-causing chemicals more dangerous than conventional cigarettes. The vapour, if produced at such levels, would be so noxious and irritating to the airway that the user would be unable to inhale it anyway, according to Professor Peter Hajer, Director of the Health and Lifestyle Research Unit at the Wolfson Institute of Preventative Medicine, Barts and The London School of Medicine and Dentistry, Queen Mary University of London. To COSH, health risks are only half the problem. “It took us a number of years to bring the smoking prevalence down from 23.3% in the 80s to the 10.7% today, and took major efforts to de-normalise this behaviour, so if this “re-normalises” tobacco use it could be very harmful, especially when we see its attracting a younger age group and non-smokers,” explains Kwong. According to a survey conducted by COSH last year, while only 1.8% out of the 2,400 participants admitting to having used e-cigarettes before at least once, the study concluded that “young people were more likely to use e-cigarettes”. “The promotion of e-cigarettes remains unregulated. Nowadays, e-cigarettes come in all shapes and sizes and can be very attractive to curious young people,” explains Kwong. Official UK figures from a study on smoking behaviour by the UK’s Office for National Statistics conducted last year support Mr Story’s claim. The study found that about one in 10 current cigarette smokers surveyed and one in 20 of the former smokers said they were now using e-cigarettes. Over half of e-cigarette users surveyed said their main reason was to stop smoking. About one in five said it was because they thought they were less harmful than cigarettes. The regulations Mr Story proposes would go along the lines of: age verification for sales, advertising restrictions, nicotine content restriction, labeling, maximum capacity tanks, maximum nicotine strengths. “The toxicity of any product is determined by its dosage. But if you regulate a product and allow them to only have 2 milliliters per cartridge, if you regulate the product and allow the bottle to only be 10 ml, just like we did in Europe, there’s no way it can hurt you,” claims Mr Story. In 2009, when the authorities began cracking down on e-cigarettes by seizing shipments into the States, Mr Story took it upon himself to challenge the decision — and succeeded. American style. Kwong believes that what COSH is doing is the right course of action. “It’s actually quite like the total ban on smokeless tobacco by the HK Government in 1987.” The ban successfully kept the product off Hong Kong shelves up till today, and according to Kwong, Hong Kong has avoided the diseases related to smokeless tobacco. “If you look at countries such as Sweden, Norway and Finland, or Pakistan and India, they have very serious problems related to smokeless tobacco, causing many cases of mouth cancers. Luckily we banned it and have no such issues. Therefore we hope the Government can do the same this time,” explains Kwong. Not known are the benefits Hong Kong missed out on from avoiding secondhand smoke had smokeless tobacco products been allowed for the past 28 years. At the moment, Singapore and Thailand are among thirteen countries globally that have taken a similar stance on e-cigarettes, banning the industry altogether.